Maxing and relaxing in St. Petersburg Florida we braved the beautiful but sweltering South Florida sunshine for dinner. I know, the sun isn’t as bad around dinner time. Don’t forget, I am from Ohio, fat and pale as paper…this is not the weather of my people. But what could possibly lure my bloated hide into the roast? Oh yeah dinner. 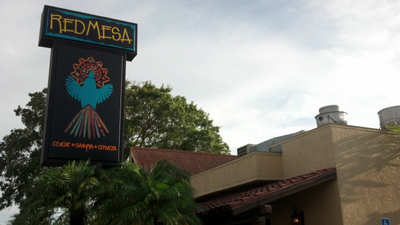 Red Mesa is one of the local favorites of our hosts who have always done well by us and our little project here. After stints at places like The 42nd St. Oyster Bar and Bern’s Steak House I will chase them wherever they want to eat, even if we have to walk through air which is hotter and contains more liquid than soup. We pulled into the packed parking lot of Red Mesa with a porch full of patient folks waiting for table, good news for dining, not as good for my core temperature. The hostess actually seemed to remember people’s faces and instead of hollering names from the door would mostly approach them individually. We had just snuck onto the bench inside, greeted by the rush of air conditioning, when we were summoned to our booth. Just another side note, being a fat dude I’m not always a fan of booths but there was a surprising amount of room. The dining area is small and paletted with Southwestern colors and art. 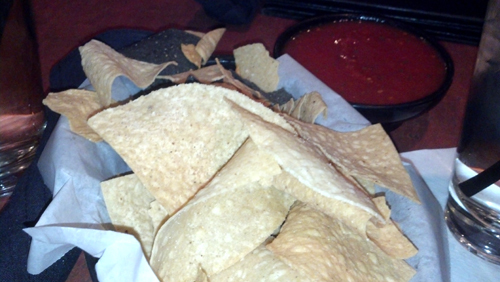 The menu features the same Southwestern theme with upscale twists compared to your standard Mexican restaurant. Our server was pretty good throughout the meal and I had no complaints. She also helped us steal the bill from our hosts who typically aren’t used to letting other folks get a tab every now and again…it was long overdue. While we were perusing the menu we were delivered a basket of chips and two monkey dishes of a smooth and tomatoey salsa studed with garlic and cilantro. We started with a couple of apps, shredded beef taquitos and chile rellenos followed by two chicken, one duck and one grouper dinners. 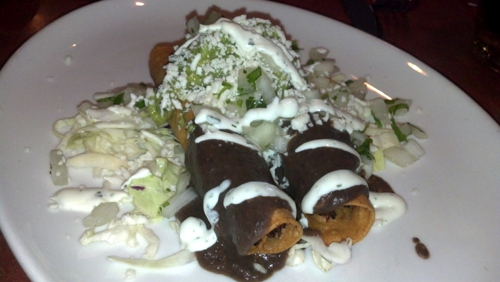 The taquitos were filled with tender beef and topped with the usual suspects like guacamole, cheese and black beans. What I really enjoyed about the dish were the tortillas which seem to be rolled thicker than most which gives the tightly rolled and fried stick extraordinary crunch to go with good flavor. The entrée version of the chile rellenos comes with two different stuffed peppers but they were laid back enough to allow us to order just one as an appetizer. We ordered the sirloin picadillo version which had chunks of beefy tenderness crammed into a well spiced pepper which was incased in batter and topped with cheese, cilantro and onion. The appetizers were familiar with touches that elevated them to refined places without losing their spicy heritage. 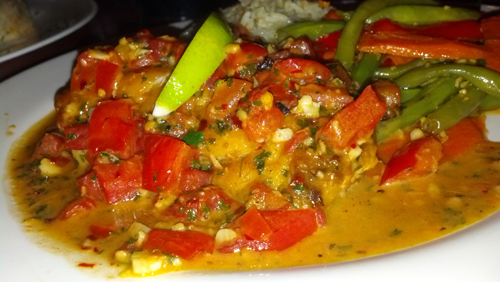 I ordered the Grouper Al Mojo De Ajo. I was curious. In our neck of the woods you don’t see a lot of fish on Mexican menus outside of the standard fish taco you are typically ordering beef, chicken or pork; so I wanted to see how they would treat the local stuff fresh out of the water. It should be good, there is a lot of coastline South of the border as well. Turns out it is fabulous. The fish held it’s own; fantastically fresh and sautéed to flaky perfection it stood up easily to the garlic, tomato and chile arbol it met in the sauté pan. A dome of rice soaked up the cast off sauce and along with the nicely cooked veg made for a stupendous dish. 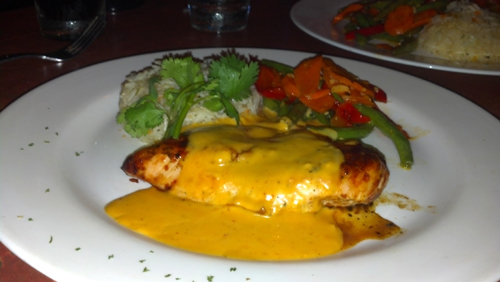 The Chicken Fernandez is a pretty standard grilled breast with rice and veg. 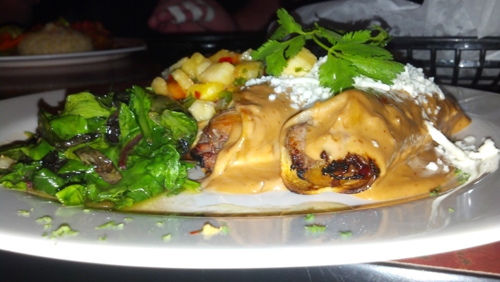 The Fernandez comes from the mojo marinade and a spicy chipotle cream sauce. The sauce, the sauce. More than pepper and cream there is a couple layers of tang I suspect is crema with maybe a little lime or other bite to it. It takes it from simple plain protein to interesting and delicious. We also ordered two types of enchiladas, chicken and duck. 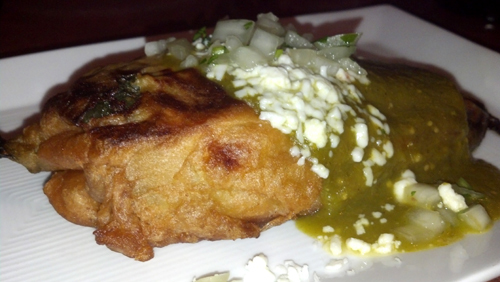 The chicken comes with two rolls one topped with salsa roja one with salsa verde, all topped with queso, cilantro, onion and crema. These chicken envelopes were perfectly familiar with flavor profiles that are tried and true with the yard bird inside, they lacked the creativity of other dinners we ordered but still tasted fine. 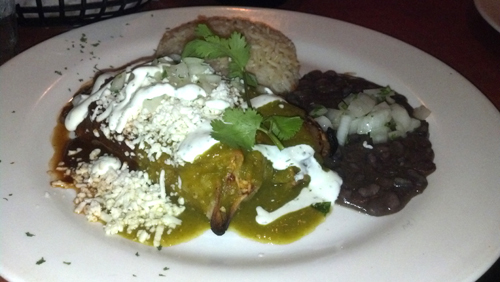 Where things went off the rails in a wonderful collision of different were the duck enchiladas. The richness of the roast duck carried tastes of onion and pepper, pretty standard. Add the queso and the raspberry chipotle sauce…that’s right the raspberry chipotle sauce which is ridiculously awesome. Balance all of the richness with the tequila braised greens and a bright pineapple salsa and you have summed up a lot of our experience at Red Mesa, some delicious takes on Latin classics, worth the heat, easy.